DNPI is a national council which is being led personally by the president of Republic of Indonesia with minister of social welfare as second-in-command along with minister of economic who are in charge for formulating national policy, strategy, program, and climate change control activity such as adaptation, mitigation, technology transfer, and funding. 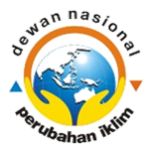 This action is a pilot program for research cooperation about constructive recommendation: the scope of peatland and peatland mapping, institutional coordination, development of information system and also a portal which serves as an exchange place for peatland information, including research and project initiatives. This research has been conducted with cooperation of Japan University and USAID. RCCC UI itself has become research partner for study of Measurement Reporting and Verification (MRV). RCCC UI, represented by Dr. Triarko Nurlambang, has been making research study concerning analysis of climate change policy asymmetry at Indonesia. The outcome is in form of study report which will become literature for making policies about climate change in Indonesia.